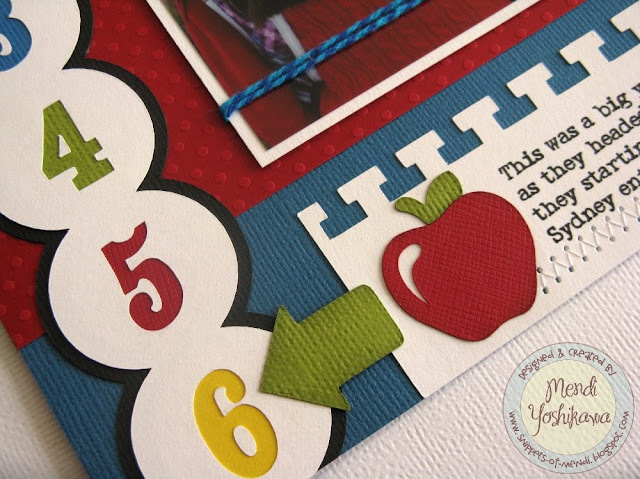 Today I have a school themed layout on Lori's Blog using her amazingly simple Back To School Layout cutting file. For $.99 this layout has tons of bang for the buck! I created this as an 8x8 page for my Mother-in-laws mini album so I wanted to keep it simple and this pre-designed layout totally fit the bill! I kept my design pretty close to Lori's with only a few subtle changes. Rather than use the bracket shaped frame under my photo, I turned it on it's side and enlarged it to bleed off the page and ground my title. I then paired some twine with a Button cutting file to accent my photo. I also cut extra circles to go under my numbers to add an extra splash of color. I added a second arrow to indicate my second daughter's grade and switched out the apple for another cute Apple of Lori's available in the Silhouette Store HERE. This page came together quickly and I thought had a lot of style and impact for a small 8x8 page! If you haven't given Lori's pre-designed layouts I try before I highly recommended checking them out (You can see all the choices HERE). I LOVE this layout!!!! I may have to case this one! Would this file also work for a 12x12 scrapbook page? Thanks for the inspiration and any help you can provide!! Thanks Judy! Yes, you just layer all the pieces and size everything together as 12x12. I can't remember for sure, but Lori may have already sized it to this size and I had to reduce it I think.